This is the P Page of our A to Z guide to plants -- how to care for them, landscaping with them, and cooking and healing with them. Pacific Puka Meryta denhamii Seem. Benefits: Surprisingly, I haven't yet found any specific benefits aside from its visual appeal. Photographed: In the Palermo Botanical Garden in Sicily, Italy. Planting and Care: This small tree, growing only about 20 feet tall, lives naturally in dense humid frost free forests. If you can duplicate those conditions you will have a happy tree. Pacific pukas grow well in full sun or light shade, but they cannot tolerate frost. On the plus side pukas are tolerant of wind and sea air. This is a strange plant to call "grass," but despite its inappropriate name it is a very appealing plant. Benefits: I didn't find any yet aside from its wonderful quality in the garden. 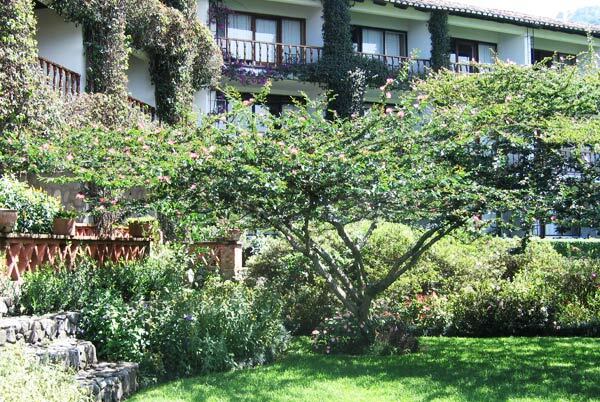 Photographed: At the Hotel San Buenaventura on Lake Atitlan in Guatemala. 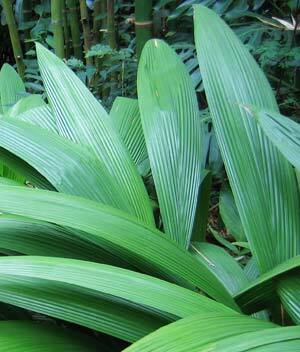 Planting and Care: Palm grass is a tropical perennial. 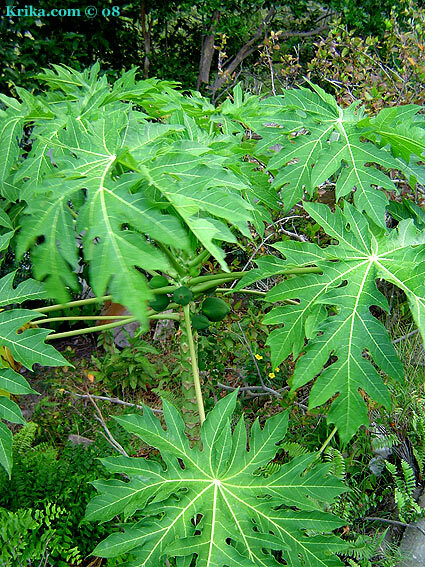 Its 2 to 3 foot leaves resemble palm leaves, hence its name. 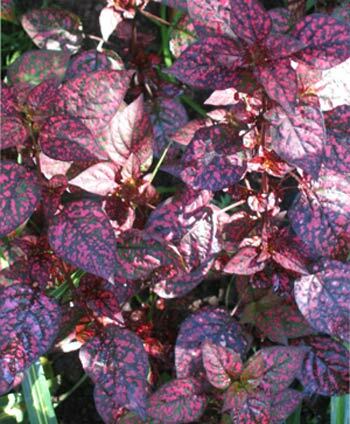 It prefers to live in semi-shade in well-draining moist soil. I have always loved these low growing brilliantly colored softly petaled flowers. I grew up with them in spring flower beds in New England and have only rarely seen them since then. When we got to Ushuaia, Argentina, it was the end of summer and the pansies were a little tired, but I was thrilled to see them anyway. It was particularly surprising to see them then because they were always considered "only for spring" flowers in New England. 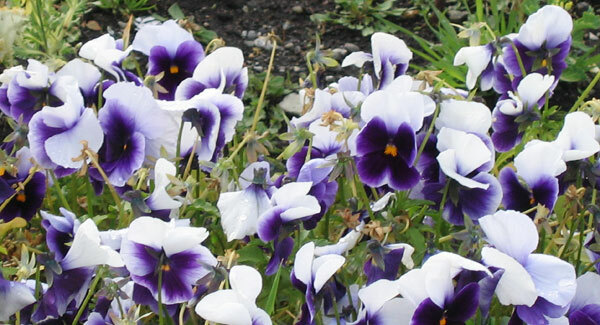 Benefits: Believe it or not, pansies are edible, both leaves and flowers, and they are also high in A and C vitamins. 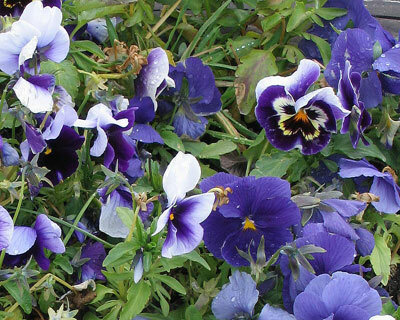 With pansies in your garden you get a lot of benefits for such a small and easy to care for investment. Photographed: In Ushuaia and Calafate, Patagonia, Argentina. 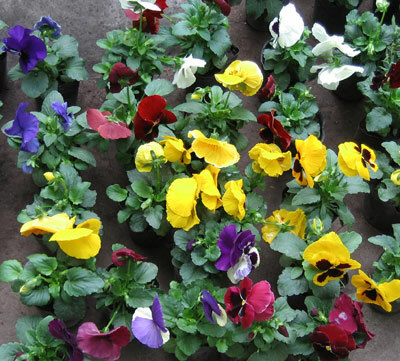 Planting and Care: Pansies are easy to grow and most often purchased at a flower shop as tiny plants that you can take home to enliven your springtime garden with their wonderful colors. They are pretty short, maybe about 8" tall, so they make wonderful "filler in" plants. They do best in full sun in the cooler parts of the world like New England and Patagonia and they prefer a well-draining soil. Water them occasionally if it doesn't rain often. **Papaya Tree, Pawpaw Carica papaya L.
These are fast growing very attractive small trees that with a little luck will last for many years in a warm climate bearing lots of fruit throughout the year. The appearance and flavor of its fruits vary considerably so always try to taste a fruit before you plant its seed. Most of the papayas sold in the United States are GMO, so do look for organic papayas to get the full benefits of this fruit and to avoid allergic reactions down the road. If you'd like to have an all natural cosmetic 'peel', think about a mix of fresh papaya and pineapple for a great facial. Give this a quick try, maybe 5 minutes and then rinse off. Next day try it for 10 minutes if you didn't get the benefits you were looking for. Remember you are trying to improve the skin on your face, not have your face digested! Green papaya slices applied to bee or wasp stings or wounds have been said to promote healing. I haven't tried this myself, so go easy at first. Try using papaya for 5 minutes on a bee sting if you want and see how it goes. Seeds or slices of the green or ripe fruit may act as digestive aids relieving constipation, bloating and gas.My husband swears by its ability to make his tummy feel good when he has eaten something dicey. Mixed with milk, the green fruit is used in some countries to reduce high blood pressure. I don't have any personal experience with this and have no idea what the milk/papaya quantities might be. If you've heard of this, please let me know so I can share it with others. Somewhere else I read that when mixed in a juice with sour orange, papaya is believed to help reduce high blood pressure. 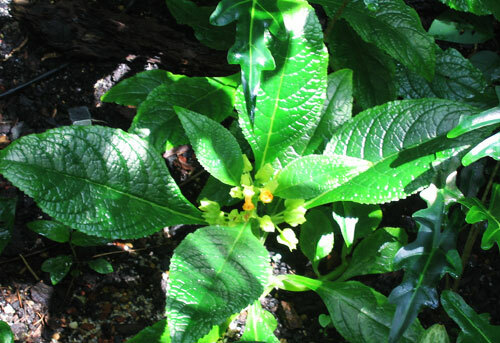 Tea made from the leaves is said to relieve kidney disorders. Papaya may be useful in weight control,because one of its ingredients, an enzyme called papain, may help to burn calories more quickly. Papain, similar to one of our own enzymes produced in the pancreas, has long been used as a meat tenderizer and it does just that. It breaks down proteins. On the down side, if you are peeling or slicing papayas frequently or in quantity, it can easily break down the skin on your hands; wear rubber gloves for protection. Papayas are also high in Vitamins C and A. From: Tropical Americas, from Mexico through Latin America. Photographed: On the left above at the top of our terrace garden at our former home in Montserrat. Below in a neighbor's garden at Lake Atitlan in Guatemala. 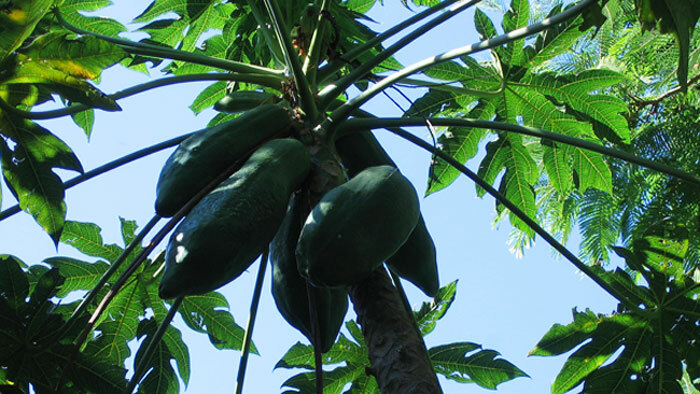 Planting and Care: My best advice for planting a papaya is to take the seeds from a fruit you particularly liked eating and toss them on good garden soil. Then wait. Once the seeds take, in about four to eight weeks, papaya trees are incredibly fast growing and will provide fruit in their first year. If you buy or are given a papaya tree, plant it in a hole 18" deep with lots of manure and hope for the best. We never had any luck planting a tree, but lots of luck with casually strewn seeds. The papaya is an enormously productive tree and its fruits, whether green or ripe yellow, have many uses. Papayas are male or female trees and you need to have one of each to get fruit. 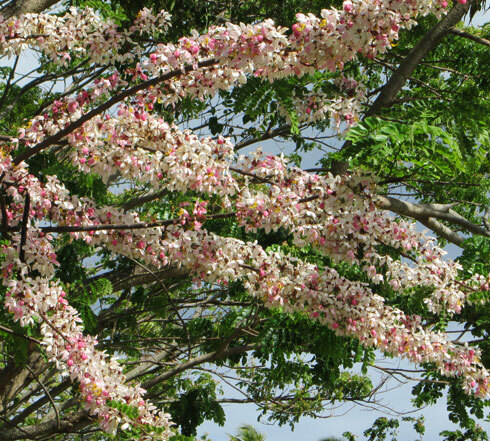 The male tree can be identified more quickly than the female as it produces flowers when it is still pretty immature. Even so, you'll still have to wait a few months to see if you have male or female plants. You will need only one male plant so extras can be discarded unless you have lots of room and a particular fondness for them. Papayas like to grow in full sun with regular rainfall or watering and a monthly dose of fertilizer, but they are adaptable within limits. Photographed: On the left in the Botanical Garden at the Hotel Atitlan on Lake Atitlan in Guatemala and on the right in the Royal Botanic Garden in Sydney, Australia, in 2013. 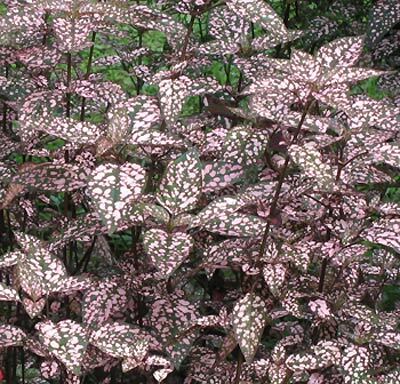 Planting and Care: This is a low growing half to full shade loving plant. 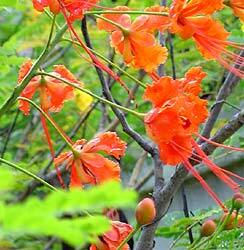 It has lovely flowers almost continuously if it also receives routine rainfall or watering. Happily for some, the plant also likes an acid soil. Parsley is one of those garden essentials that can almost be taken for granted. We use it in every way imaginable every day. 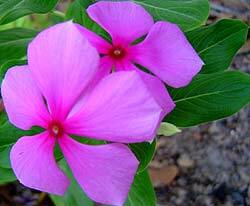 It grows like a weed and seems to have few garden enemies even in the Caribbean where that is rarely the case. This is a perfect plant to grow organically. Benefits: Used fresh the curly variety is high in amino acids, aspartic and glutamine, and also rich in vitamins and minerals. The Chinese believe that parsley, which is loaded with luteolin, is a very beneficial in alleviating disorders of the eyes. Photographed: In our garden at Lake Atitlan in Guatemala. Variety I've Planted: "Forest Green" I found this parsley to be especially wonderful in the highlands of Guatemala. It grew like a weed. We used it in almost everything we cooked and fresh in salad and in dozens of other ways. First lost to the volcanic eruption in July of 2003, we replanted this most essential herb many times, both in the garden and in pots by the terrace. Benefits: The flat leaved Italian variety is more chic these days. Either one is delicious and can be used liberally every day in every way! Photographed: Below on the left are the little plants I grew from seed that were ready to be planted in our herb garden at our former home in Montserrat. 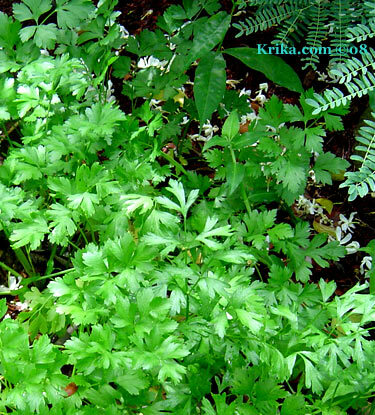 Planting and Care: In a tropical environment, plant parsley in moist well-drained soil and fertilize it regularly. In the Caribbean, flat leaved Italian parsley and frilly leaved parsley both seem to prefer semi-shade to full sun to thrive. Overall the flat leaved variety wins my vote as it was always much healthier than the curly variety in the Caribbean. On our terrace garden in Taxco, Mexico, we were able to keep our potted frilly parsley plant alive and thriving for at least four years. 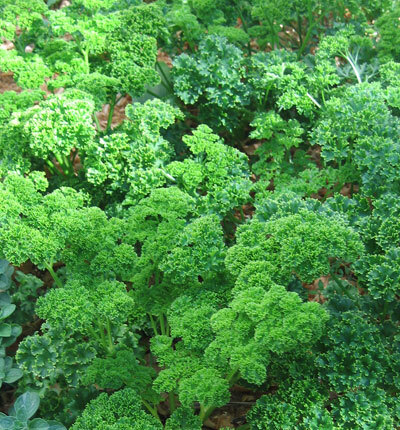 In Montserrat, parsley plants are viable for no more than one year; more often than not, six months is the limit. In the environment at Lake Atitlan in Guatemala, our frilly parsley has been thriving for almost a year. The plant is said to be a biennial so I have my fingers crossed. **Peanuts, Groundnuts Arachis hypogaea L.
A few years ago I planted some peanuts just to see what happened. As it turned out peanuts are beautiful plants that produce tiny yellow orchid like flowers; they would find a welcome place in any tropical flower garden especially used as a border planting. There are two types of peanuts. The erect type has upright stems which is what we have grown (remember the seeds come from the supermarket). Prostrate peanut stems grow on the ground and have the advantage of a higher yield with all peanuts ripening at the same time. This is the one to plant if you are commercially minded about your peanut crop. Benefits and Risks: Peanut butter and jelly sandwiches were a staple children's food when I was growing up and I never lost my taste for them. Sadly, it seems something has been done to commercially grown peanuts in the States because I now have an allergic reaction to US produced peanut butter. Maybe they've been genetically modified or maybe it is something else, but it seems fewer and fewer people are able to eat peanut butter so the health benefits of eating peanuts is meaningless. Thanks Monsanto, I can no longer eat a food I have loved for 50 years. From: Peanuts are native to Brazil. Harvesting: About five months from the date of planting, the leaves of the peanut plants will begin to turn yellow -- this is the time to harvest. Dry the plants with the peanuts still attached to the roots for two to three days before shelling and eating the fresh peanuts. Ideally you should get about forty peanuts per plant. We've never done that well, but then we aren't Jimmy Carter! Photographed: In our upper garden at our former home in Montserrat. 1. First buy some unroasted organically grown peanuts. If they are fresh and taste good, husk them removing the papery seed covering. In your garden, plant each peanut about two to four inches deep and about four to six inches apart in the row with rows about three feet apart. 2. In a few weeks the plants will be up and you can thin them to about one foot apart in the row (if you are determined to have lots of garden grown peanuts). I leave them at four inches and still enjoy pulling up the plants and finding -- PEANUTS! And, I especially enjoy having a row of such beautiful plants. 3. Peanuts prefer to grow in full sun, but will tolerate a little shade. They like a fertile sandy or loose soil with a pH of about 6 if they can have it and regular rainfall or watering. Boron is one of the very necessary components of good peanut growing soil and we were fortunate in Montserrat to have the active Soufriere Hills Volcano producing the boron so essential to peanut plants. 4. Your peanut bed should be moved after two years to somewhere new in your garden. This is one vegetable I had no luck growing in the Caribbean and it wasn't for lack of effort. Maybe it was just too hot. But, if you live in a northern cool climate, don't be dismayed. In those conditions, I used fresh peas from the garden in salads and in too many ways cooked that I can't even count. They are wonderful. Benefits: Nuts have over the years faded in and out of popularity among nutritionists, but one has to admit nuts have been a staple in the human diet for thousands of years and that can't be an accident. They taste wonderful and they are good for us. Pecans are especially good for us because they are an excellent source of Vitamin E.
Our lavender pentas arrived in our deck garden on their own and did well enough with no help that I thought I was dealing with an attractive weed. As it turns out pentas are tough perennials. They have long lasting blooming periods with red, pink, or lavender flowers as you can see below. 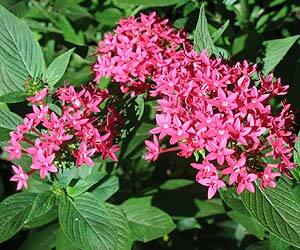 Benefits: Pentas flowers attract bees, butterflies and birds. 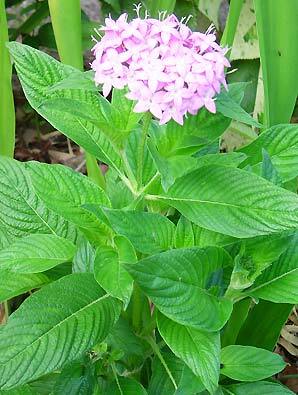 In traditional medicine pentas roots, leaves, and flowers have been used to treat fairly serious health problems. From: Tropical and southern Africa. Photographed: In our deck garden at our former home in Montserrat in the Caribbean and at Hotel San Buenaventura in Panajachel, Guatemala. Planting and Care: Pentas are said to prefer a sunny location, but I have seen lovely ones growing happily in semi-shade. Watering doesn't seem to be much of an issue aside from reasonably regular rainfall. This is just about my favorite flower in the whole world. Its scent is heavenly. Be sure when you buy peonies for your garden to get the old varieties as they are the ones with scent. I found myself heartbroken when I saw a friend's elaborate garden in New Hampshire planted with peonies that had no scent at all. 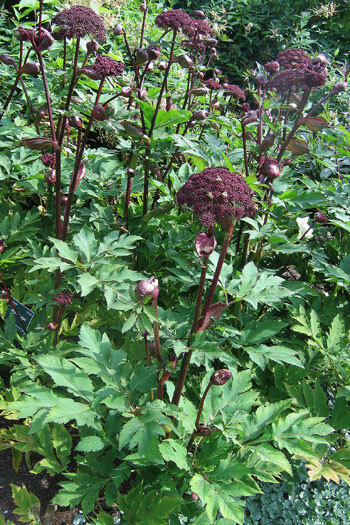 Benefits: It has been said that the medicinal benefits of the peony have been in use in Europe for over 2000 years. From: France, Switzerland and Italy. Photographed: In the Ortobotanico (Botanical Garden) in Naples, Italy, in 2013. 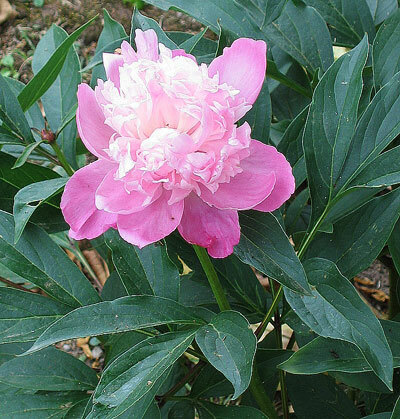 Planting and Care: Peonies are shrubby plants that in my experience reached a height of between 2 and 3 feet with a spread of about the same size. They have soft leaf-bearing stems which thrive all summer long and more erect tougher flower stems that begin to appear in May and last maybe a month and a half. They are perennials that do well in cooler climates planted in full sun in fertile, rich soil with a relatively neutral pH. Most important for lots of beautiful flowers is to plant your peony in full sun away from any competition. I planted mine in the middle of a 4 foot border garden with 2 feet on either side and surrounded them with ever blooming California poppies. Mint plants are hearty and once set in and thriving they will spread underground. 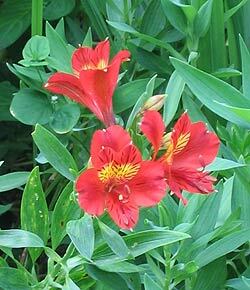 They are perennial and they can quickly take over your garden. This is a wonderful plant, but it might best be grown in a pot. Benefits: I have personally found peppermint tea to relieve digestive upsets. I pick several fresh leaves from my plants and steep them in boiling water for 5 minutes or so. Pericón, Sweet Scented Marigold, Mexican Marigold, Mexican Mint Marigold, Mexican Tarragon, Spanish Tarragon Tagetes lucida Cav. Benefits: Pericón's fresh or dried leaves are used as a tarragon substitute, a medicinal tea may be made from its dried leaves and flowers, and burning the dried leaves inside your home will rid it of insects who may have settled in. We used it routinely in Taxco, Mexico, to rid our home of tiny spiders that lived in the very high ceilings. It was very effective and not damaging to our health as would be any commercial chemical insecticide spray. Photographed: I thought I had taken a photograph, but I can't seem to find it. Planting and Care: This plant is a member of the marigold family and there are few easier plants to grow. Just make sure you find it a place that will give it the all day full sun it requires. 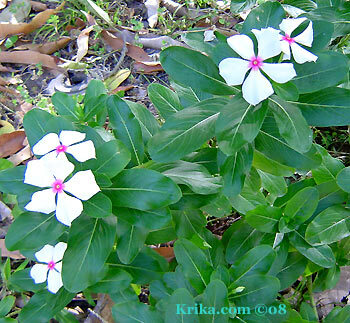 Our periwinkles in Montserrat were lost to the volcanic eruption of July 2003, but not long after, tiny periwinkle plants began appearing all over our garden. 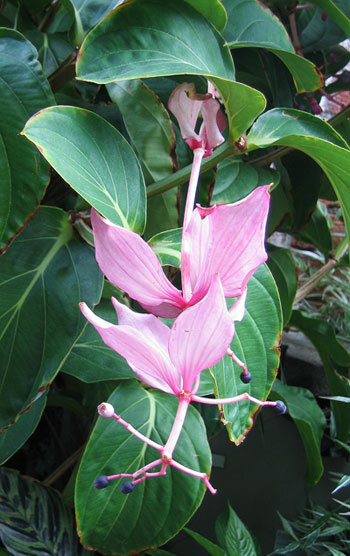 It is a friendly looking plant, not at all exotic, with small lilac, pink or white flowers. It fills in all by itself here and there around the yard. 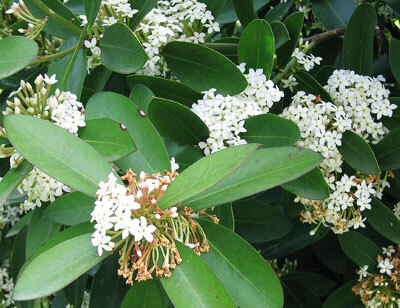 Benefits: Aside from being used as a treatment for high blood pressure, its leaves were a Carib curative for diabetes. 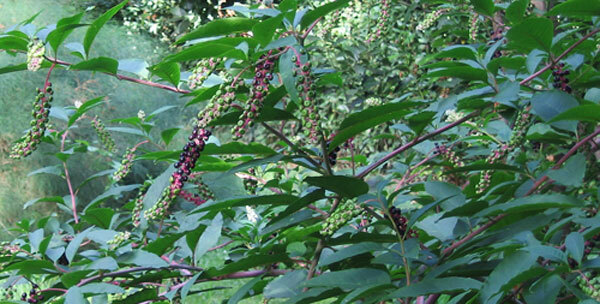 This unassuming plant also produces vinblastine, a component of a drug used in the treatment of Hodgkin's disease and vincristine which has proven beneficial in the treatment of leukemia. Photographed: The two photographs on the left and right were taken in brighter parts of our shady terrace garden at our former home in Montserrat, in about 2008. 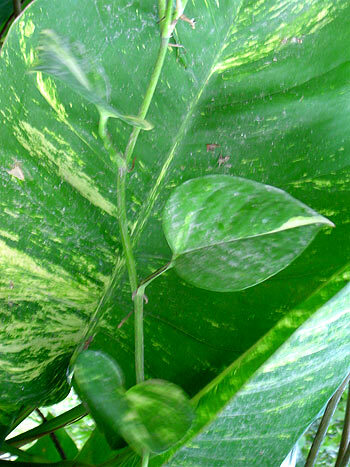 We encountered it again on a visit to Viscaya in Miami and you'll see that plant in a photograph below. 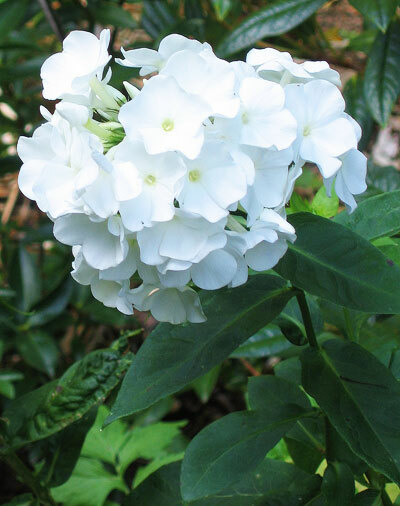 Planting and Care: Periwinkles will grow just fine in the sun or in the shade as long as they receive some very occasional rainfall or watering and a once in a while dose of fertilizer. Photographed: In the garden at Viscaya in Miami, Florida, in 2014. These are very popular brightly and delicately colored long lasting cut flowers. Planting and Care: These lovely plants are perennial only in places where there is not a hard winter. In cooler climates, dig them up in the fall giving them a good cleaning and store in a dry mix of soil and peat moss until they can be planted again when summer approaches. 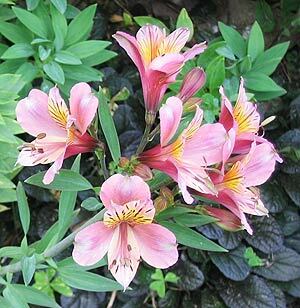 Peruvian lilies in your garden should be given a good amount of space which they will quickly occupy. When mature they will be about 4 feet high and half as wide. 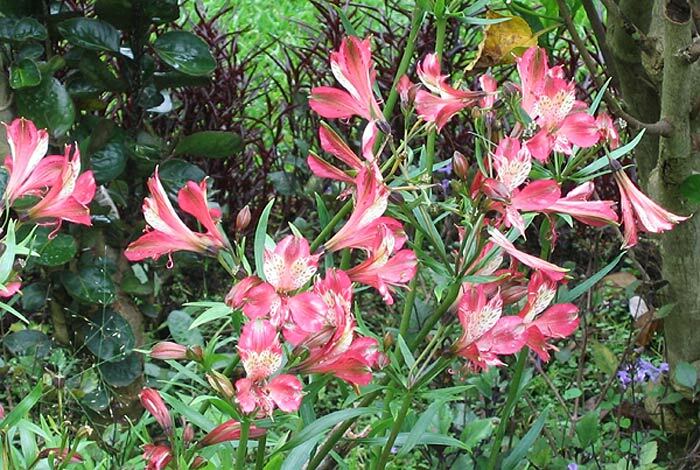 Plant your Peruvian lilies in rich well-draining soil in a place in the garden that receives morning sun and, if you're in a hot climate, do keep them in a spot where they will not have to suffer the hottest afternoon sun. Water them frequently if it doesn't rain, but take care not to over water. There are a variety of natural organic pesticides available to gardeners who do not wish to use more commercial and more dangerous insecticides. This is not to say that because something is organic that its use presents no risks. Below are listed a few of the organic materials I have come across over the years. This is a similar plant based poison to rotenone described below. It is extracted from the root of the plant and used as a fish poison by people living in jungle areas in South America. I have no personal experience with its use. The most potent pesticide to be retrieved from the neem tree is found in its seeds, but these can be very difficult to harvest on a non-commercial basis. If you have a neem tree in your yard as we did, I would love to hear your ideas on how to collect the seeds. That being said, we have had good luck simply soaking lots of the tree's fresh green leaves in a large bucket of water for a few days. We strain it and use the liquid in a commercial back pack sprayer. It doesn't smell wonderful, but it does work wonderfully. This is a natural insecticide made from the dried flower heads of Dalmatian Chrysanthemums Chrysanthemum cinerariifolium and the Painted Daisy Chrysanthemum coccineum. Be very careful not to confuse the name of this 'natural' insecticide with the highly poisonous commercial products called pyrethrins. From memory I regard this as a real helper in my New England gardens. It was sold as a natural plant material based insecticide and it worked wonderfully on aphids and most other average vegetable garden bugs with a very light application. It did not work on tomato horn worms and other such horrific creatures, but it did surely make gardening a lot more rewarding than it might otherwise have been. Rotenone was used originally as a fish poison by people living in South American jungle regions so it should be kept away from or not used near running fresh water streams or in areas where any rainfall will send it quickly into ponds, lakes or the ocean. 1. Soap is a wonderful alternative to more dangerous chemicals. To treat a variety of insects we use a professional insecticide sprayer, but ours is filled with soapy water which works just fine. Use a light mix of a lemon scented powdered clothes detergent (the simplest you can find). A light mix might be about 1 teaspoon mixed into one quart of water. Spray this on in the evening as sometimes the bright tropical sun can burn plants with a recent wet soapy residue. 2. Mix 1 tablespoon of dishwashing liquid and 1 cup of vegetable oil and use 1 tablespoon of the mixture in 1 cup of water. Test one plant first to see if there are any negative effects. Apply as a spray and check 24 hours later. I haven't used this mix, but if you do let me know how it works for you please. Mix 5 tablespoons of pure soap to 1 gallon of water. In my continual attempts to fool the bugs, caterpillars, wasps and other nasty critters, I came across a very basic idea. Many of the nasty creatures find my beautiful plants by smell so I fool them. I take whatever I have lots of that have strong smells (hot peppers, onions, or other traditional non-attractants) and I mix them in the blender with a bit of water. I strain the mixture, add more water if I can without diluting the smell too much and then spray it on my most vulnerable flowering plants whether ornamental or vegetable. It works wonders, so who needs the stuff that gives kids cancer? 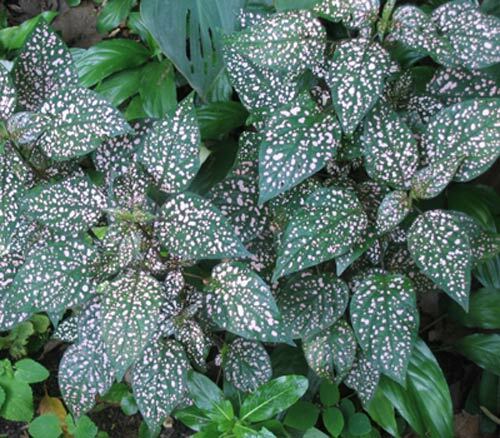 This is that ever enlarging area of white on your normally green plants. It doesn't look too terrible until everything is pretty dead, so best to stop its spread as soon as possible. 1. Mix and then shake the following ingredients well and spray your plants top and bottom in the late afternoon. 2. Mix and then shake the following ingredients well and spray your plants top and bottom in the late afternoon. Anything produced by Monsanto, Bayer, Syngenta or Dow, but especially any and all commercial weed killers. If you have room in your garden, this is one of those vines you just must have because it is so extraordinary. You will be doing the world a favor as this plant is endangered by loss of habitat. Benefits: It is a stunning vine when in full flower. Planting and Care: This woody vine is best planted in a humid environment with moist fertile soil in a semi shady area. It is not at all cold tolerant, in fact it doesn't even like chilly weather, liking temperatures 60° F. and higher. You'll probably be happiest with your plant if you can find a way for the pendant flower stalks to show off themselves as you can see in the photographs. I found what I thought to be two separate very appealing plants and only later learned from a a visitor from Germany that they were one and the same. 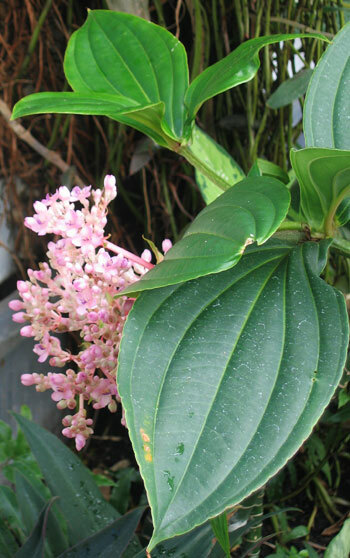 Medinilla magnifica is an epiphyte most suited to hot humid tropical climates or to a life inside the comfort of a well heated home in more northerly places. It normally grows in the crooks of large trees and can reach the enormous size of nine to ten feet. Photographed: On the left below in the Winter Garden in Auckland, New Zealand, 2013. On the right below in the Botanic Garden in Wellington, New Zealand, 2013. Planting and Care: This extraordinary plant is an epiphyte that will grow to be more than 10 feet in height. It is tropical in nature requiring that sort of climate, though sometimes it is grown as a hot house plant. It needs lots of moisture in the air and to find itself in a sunny place that gives it freedom from the very hot afternoon sun. Its soil should be a type that retains moisture, but does not remain wet. This is a very old, sweet smelling lovely flowering plant found in absolutely every one of the best gardens in New England (at least when I was a child). 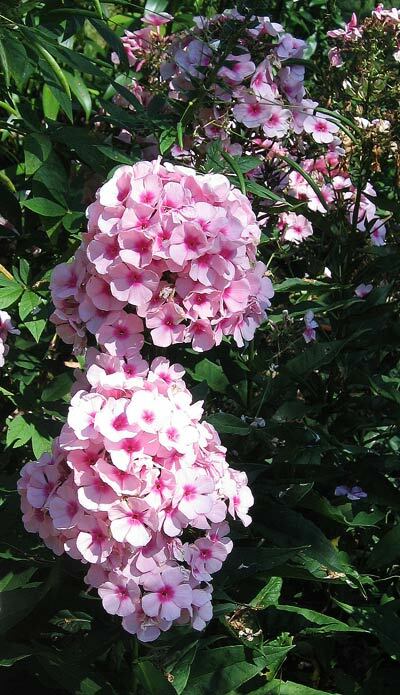 Benefits: Aside from their delightful appearance in the garden, phlox are said to have been used in traditional medicine for a variety of ailments. From: Cooler climates in America. Photographed: In the Botanic Garden in Wellington, New Zealand, at the Hotel Atitlan on Lake Atitlan in Guatemala and at the Thuya Garden on Mt. Desert Island in Maine. 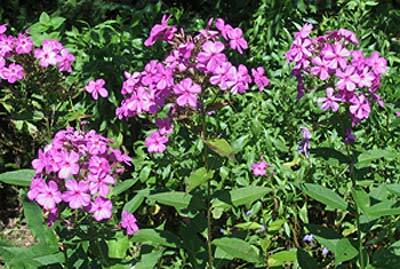 Planting and Care: Phlox is a perennial liking sun and a reasonable amount of rainfall or routine watering. It is best to keep water off the leaves when you can because the downside to this plant is its susceptibility to downy mildew. It is very winter hardy, but does not require a period of deep cold each year as do some plants like rhubarb. 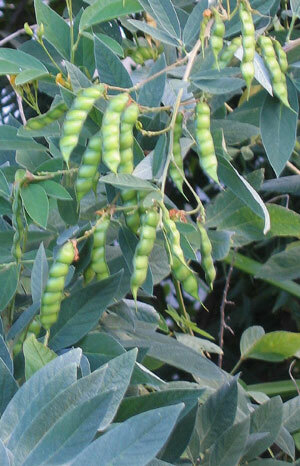 Pigeon peas are a hot climate agricultural alternative to green peas which will not produce food in a hot climate. Benefits: The mature seeds of the pigeon pea is an ideal vegan food, supplying high levels of nutrients especially protein. It will grow in the hot and dry conditions that are becoming all too common and it seems resistant to many potential insect predators and plant diseases. As well, many cultures around the world use parts of these plants in traditional medicinal curatives. 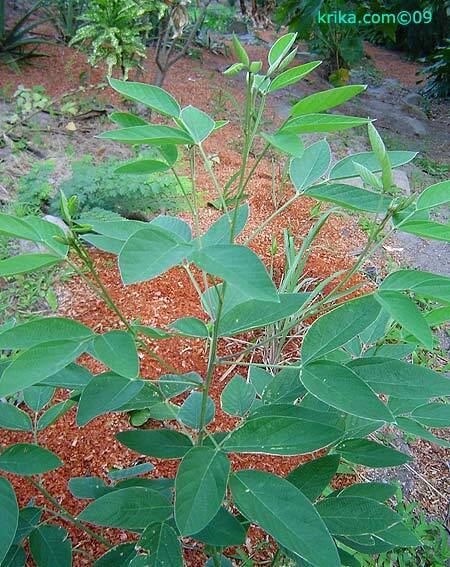 From: The pigeon pea is known to have been growing in the Indian sub-continent 3500 years ago. 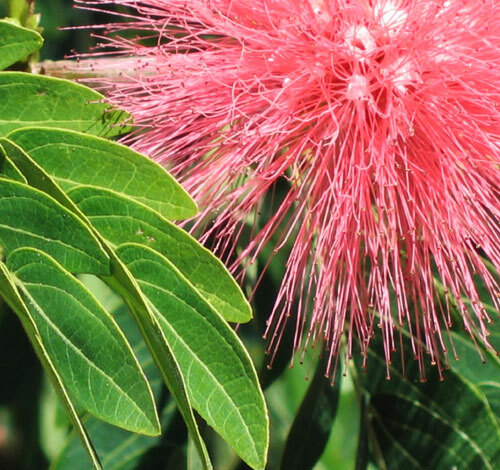 Planting and Growth: This perennial plant is ideally suited to the Caribbean summer environment -- hot and dry. It is very adaptable to soil conditions growing well in acidic or sweet soils. Plant it in full sun or with a little shade and it will do just fine producing lots of pigeon pea pods to keep you busy shucking peas while chatting with friends in the evening. We spent many an evening this way with friends in Tobago and with not a few rum and cokes. Text and Photographs ©krika.com 2009 and ©GreenGardeningCookingCuring.com 2012/2018. 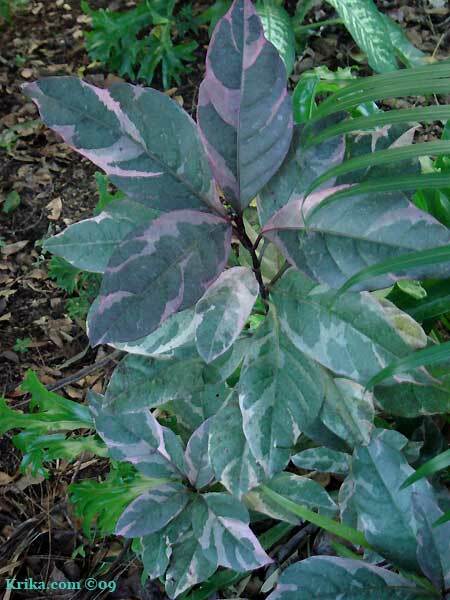 This is a lovely foliage plant especially since it will thrive in shady conditions. Best of all it has very sweet blossoms in the spring. It will grow to be about 12 inches high and equally as wide. 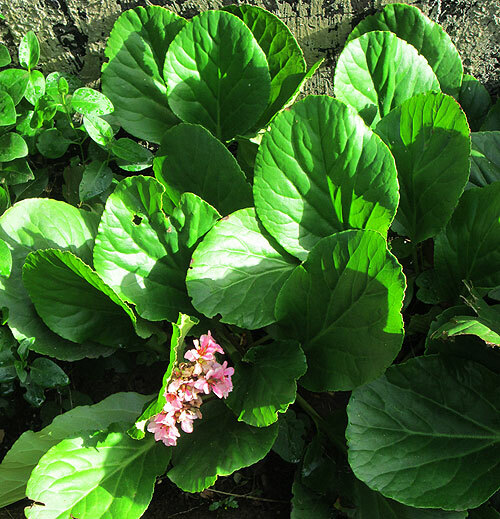 Benefits: The Bergenia family of plants have several traditional health benefits. Photographed: At the Hotel Atitlan on Lake Atitlan in Guatemala in 2010 and in 2012. Planting and Care: This plant prefers a semi shady or shady place in the garden in an area that is usually moist and has woodsy soil. It is easy to care for and once settled in, it is tolerant of some mistreatment by nature or even by us. 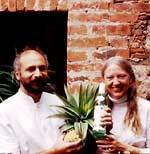 We planted our first pineapple at our home in Taxco, Mexico. I cut off the leafy top of a pineapple, let it dry in the sun for a few days and then planted it. It made a great potted patio plant, immune to all of Taxco’s bugs. After a couple of years, it bloomed and then came a tiny pineapple. It grew and finally ripened and we had our own fresh pineapple juice with a touch of rum to celebrate. It was the most delicious pineapple we’ve ever eaten. We also grew a few the same way in Montserrat, but sold our home there before the harvest. 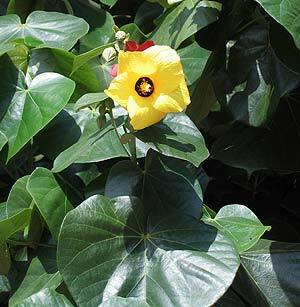 You might also benefit from knowing that the Hawaiian and Mexican varieties are relatively friendly plants. The Caribbean variety we had on Montserrat will shred your skin in a heartbeat. Benefits: Pineapples are good sources of vitamins C, B1 and B2, and minerals phosphorous, calcium and iron. Bromelain, its wonder ingredient is an enzyme powerful in reducing the inflammation in arthritis and even in inflamed gums. Apparently, the core of pineapples which is routinely tossed is the area of the fruit where you find a high concentration of bromelain, so eat up. The fruit may also have a beneficial effect on blood pressure. Raw pineapple slices can be used to reduce the effects of insect stings and sea urchin wounds. Photographed: In the terrace garden of our apartment in Taxco, Mexico. Planting and Care: Normally pineapples are planted using the sliced off leafy tops of the pineapple fruit. Set the tops to dry in the sun for a few days, then remove some of the lower leaves and set the plant in a pot relative to the size of the pineapple. Plant it shallowly in enough dirt to hold it upright and not more. Give it very little water and set it in a bright, but not sunny area. Within a few days move it into the sun and give it a little more water each day, remembering that pineapples are bromeliads and live with very little moisture -- too much watering and they will rot very quickly. Pineapple plants love to be in full sun or dappled shade planted in slightly acid soil. The plants are not small, but will do just fine if living about one and one/half feet from each other. It is also useful to know that using a sucker at the base of the fruit while it is still growing on the plant will produce a bearing plant in one year, while using the top leaves like we did will take two years more more to bear. Once the plant has flowered, you can expect your fruit to be ripe within ten months. Harvesting: Pineapples are ripe when tapping them makes a dull sound. Diseases and Insects: Nematodes and fungus are two to watch for. This link will lead you to a page with excellent photographs for preparing a pineapple for planting. I couldn't have done it better myself. This is another very good site. With these two you should be off and running. 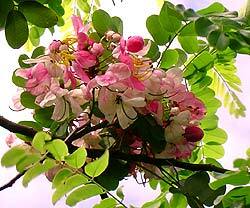 The pink cassia tree is beautiful with its lush covering of long lasting luscious pink flowers. 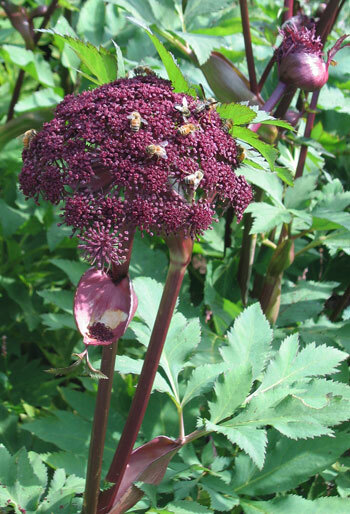 Benefits: Its attractive long and round very dark brown seed pods provide a pulp that is said to act as a laxative. 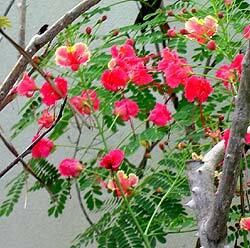 Photographed: The pink flowers to the right and left were photographed in our garden at our former home in Montserrat. 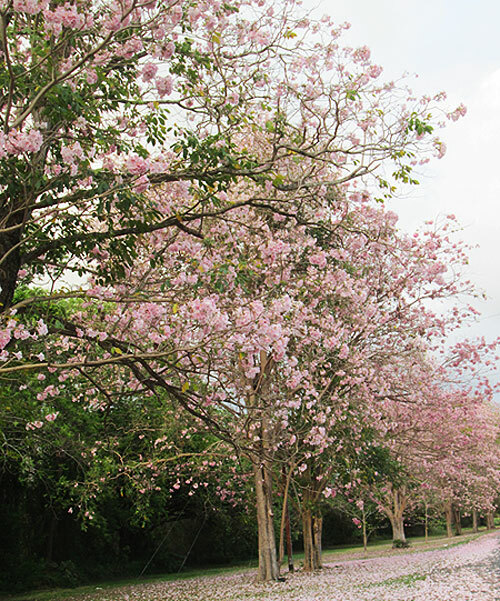 The pink flowers and trees below were photographed in Tobago in 2018. 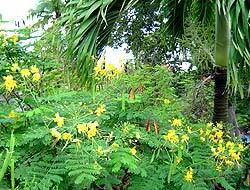 Planting and Care: The cassia usually grows to about thirty feet tall and normally blooms in Montserrat in May. Sadly, we had to cut ours down and have it removed because it had been so ravaged by termites. The tree stump left was only about a foot high, but branches soon began growing sideways from the stump. It looked like a very bizarre bush as the branches extended about ten to twelve feet from the two foot high stump. We had the space for it and we had the guilt to deal with it so we let it grow. But, we had planted a Mexican lime tree nearby and as the Cassia grew it invaded the lime tree's space. Even when I cut branches from the cassia that were touching the lime tree, within a few days more cassia branches would be touching the lime tree. They were definitely not friends. So....the cassia had to go as we were desperate to have fresh limes on an island once known for it's lime juice preventing scurvy in the British navy. What was especially good news is that there was a small volunteer cassia growing in our hedge garden. We transplanted it and it is off and running. This is a tree I had read about when trying to learn about our yellow poui trees in Montserrat. I never saw one until we visited Sicily. Benefits: It is believed to have significant medicinal benefits for a variety of illnesses. From: Mexico to northern countries in South America. Photographed: At Villa Giulia in Palermo, Sicily, in 2012. 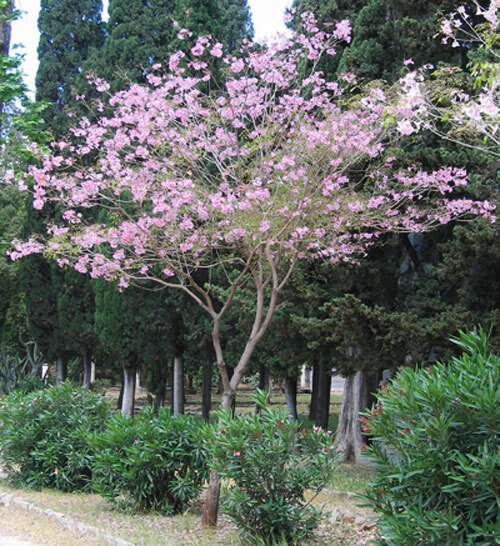 Planting and Care: This is a warm climate tree that prefers a place in full sun with a medium amount of rainfall or watering. 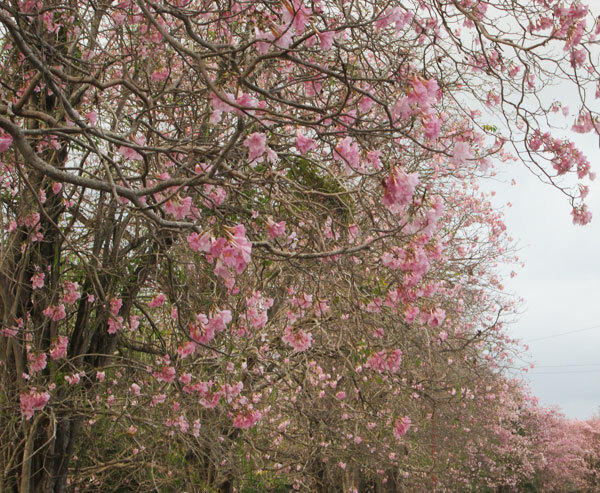 In tropical places it is often used to line residential streets because of its delightful blossoms and ease of care. When mature it will reach a height of almost 100 feet with a trunk oftentimes 3 feet in diameter. 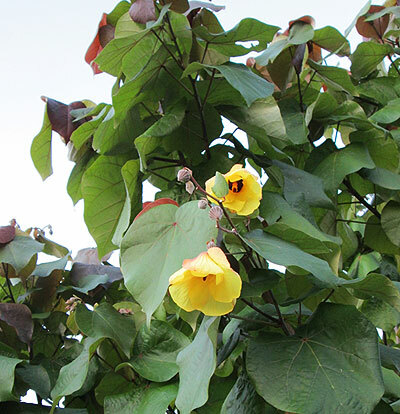 To see the Yellow Poui Trees in our former garden in Montserrat, please click here They were glorious! My #4 Tree Mystery was solved by Glenn a visitor to my website who lives in Brisbane, Australia. Many thanks for your help. 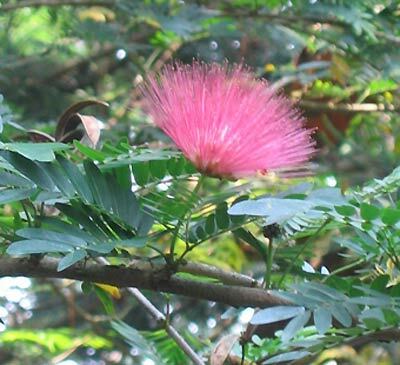 I looked at lots of photographs of this tree and honestly couldn't tell the difference between it and a mimosa tree called Albizia julibrissin. I can see I still have a thing or two to learn about plants. Years ago I gave up on Peterson's Guide to Birds because I honestly couldn't tell one from another. Looks like I may just have to rely on an expert! Benefits: On my latest search (Fall of 2018) I didn't find anything. Photographed: At the Hotel Atitlan on Lake Atitlan in Guatemala in May of 2010. 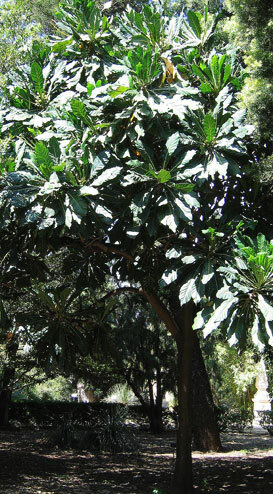 Planting and Care: This is a small tropical tree or large shrub which when mature will reach a height of under 20 feet. It does though have wide reaching branches which carry the lovely lightly scented powder puff flowers that you can see in my photographs. It prefers to live in full sun and it can handle a climate that gets cool, but not one that has a true winter. 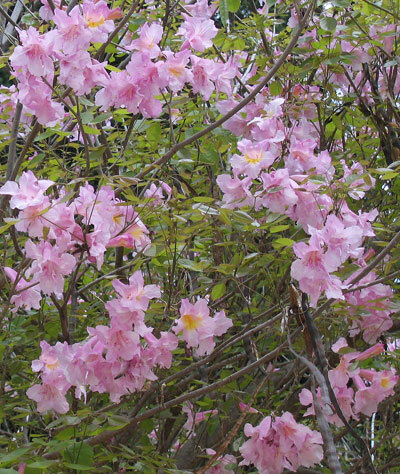 This is a very hardy vine with delightfully delicate pink flowers seemingly all the time. It is not the most showy or extravagant of flowering vines, but it surely has a place in any garden needing a resilient non-clinging vine. As a vine, its advantage is that it doesn't have clinging tendrils so it will grow where you put it and depend on you for where to go from there. Benefits: I didn't find any references to its benefits except its appeal as an ornamental. Photographed: In our garden in Panajachel at Lake Atitlan in Guatemala. 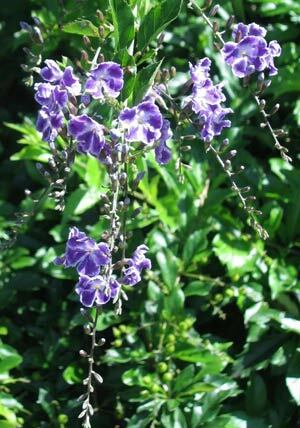 Planting and Care: This is a warm climate plant that will live in the most southern parts of the US as a perennial in your garden. It can be planted in containers, but that doesn't seem to be the best home for Podranea ricasoliana. It prefers to be set in rich soil that has a higher than normal amount of sand to ensure that it is well aerated. Mine did fine in a mixture of sharp sand and composted soil mixed about 50/50. Find a place in your garden with an existing support for the vine that will give you the most flowers when planted in full sun. It will need routine rainfall or watering when the top inch or so of soil is dry. The pistachio is one of those dream nuts that in Sicily where they grow produce the worlds best pistachio ice cream -- my favorite. There the ice cream is not bright green and tasting of almonds as we know it in the States. It is a muted green filled with nuts and a flavor I regularly dream of. Benefits: Pistachios have now been added to the green tea, kale bandwagon, and I ask only that you use your brain and try to conceive of one plant that is going to appreciably change your life or health. That being said, my husband daily shucks about a quarter of a cup for me and calls them "happy nuts." 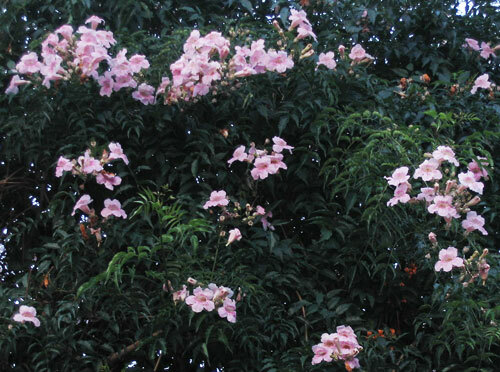 This is an attractive flowering bush that when I took these photographs had begun to fade from glory. I couldn't resist including it here with so many of my favorites, but I do not recommend planting it. 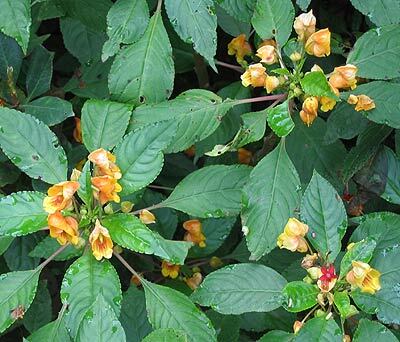 Benefits: Parts of this plant have been used in traditional medicine in the treatment of poisonous snake and spider bites. Photographed: In the Naples, Italy, Botanical Garden 2012. Planting and Care: I do not recommend planting this bush or small tree. Warning: Acokanthera oblongfolia Hochst. 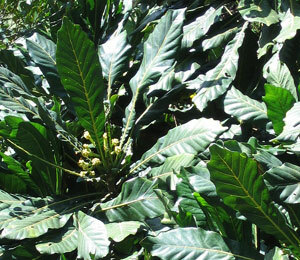 Codd is a deadly poisonous plant "which can kill within minutes when ingested or when sap enters into the blood stream. All parts of this tree are toxic including the fruit, especially when it is unripe." 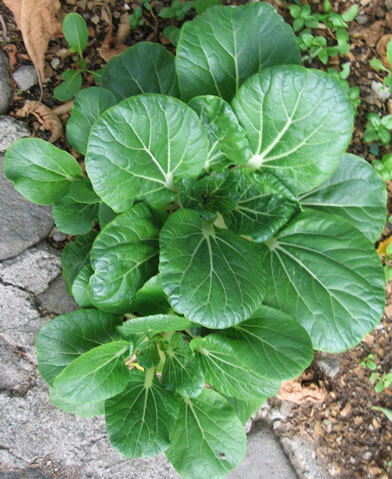 This is our favorite vegetable for stir fried Chinese food and it grows wonderfully all over the Caribbean, even in Montserrat as you can see from the photographs below. These were young plants growing in our herb garden as a temporary filler plant, followed by yet a few more square feet of basil. Benefits: Pok Choy is one of the latest foods to be deemed essential to human life and a cure for everything that could ail you, especially something to do with your heart. 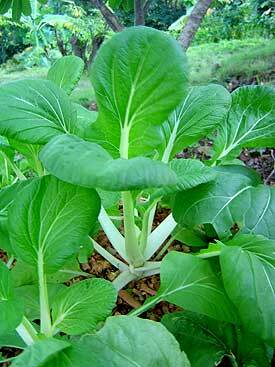 Pok Choy is loaded with vitamin A and is delicious. Surely it can't hurt you, but I haven't noticed that it appreciably improved our physical health. Planting and Care: As with most everything in a tropical setting, it is best to start your plants in seed trays. When they start to grow, fertilize them well with something like Miracle Grow, move them toward a more sunny location everyday and keep them moist. When they are about three inches high, transplant them to a sunny or semi shady area of the garden where the soil has been loosened to a depth of at least six inches. Fertilize them more than you ever thought would be necessary with good compost if you have it and give them lots of water. Watch out for hungry caterpillars coming from white butterflies; we sprayed with soap every other day or so for a pretty short period of time when we had our home in Montserrat. Photographed: To the left in our semi-shady herb garden at our former home in Montserrat. On the right in our garden at Lake Atitlan in Guatemala in 2015. This was a wild plant in my childhood, one we enjoyed arming ourselves with for our hysterically funny child wars. During its ripening fruit season we regularly arrived home almost unrecognizable with purple clothing and purple skin. It must have driven our mothers mad, but the memory of this period of childhood remains one of my fondest. I have to confess on our recent visit to New England I spotted 'ushgush' one day and confess it was only my adult 'restraint' that stopped me from starting an ushgush war with my beloved and equally foolish husband. Benefits: Children love it! And, Wikipedia has this to say about it, "...some parts can be used as food, medicine, or poison if properly prepared." Photographed: In the Botanical Garden in Naples, Italy, in 2014. Planting and Care: I wouldn't recommend it if there are children in your area. 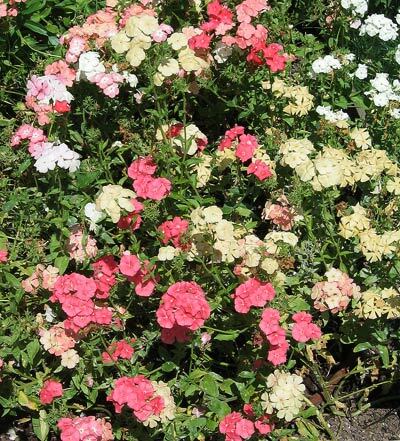 This is a colorful addition to a bright shade garden and the plants come in pink, white and red spots to suit all tastes. Benefits: On a recent search (10/9/2018) I didn't find anything useful on Google. 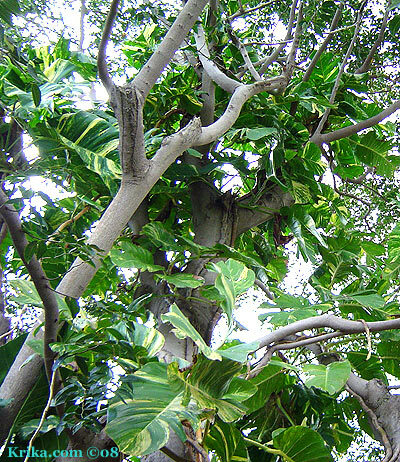 Planting and Care: These low growing tropical shade plants are hearty, but do require moist fertile well-drained composted soil and humidity in the air to be at their best. 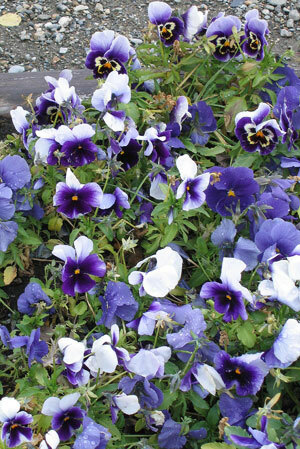 Their color will be enhanced by lower light which is an unusual benefit to folks with shady gardens. The pomegranate is a wonderfully exotic fruit that is not only beautiful, but tastes good too. I had my first experience with them when in college in Boston, Massachusetts. Back in those days there was a fabulous food market just behind Beacon Hill where you could buy whatever you desired from fruit and vegetables to meat and fish. At Christmas time it was also a place to get your tree and garlands of natural greens. The fruit of the pomegranate tree is split open revealing seeds with a lovely red crisp jelly like coating. Take a bite, enjoy the coating and spit out the seeds. Benefits: The pomegranate is said to improve circulation and to be not only an especially powerful antioxidant, but a builder of red blood cells too. Grenadine, at least the real thing, is made from pomegranates and helps to make a truly memorable tequila sunrise! 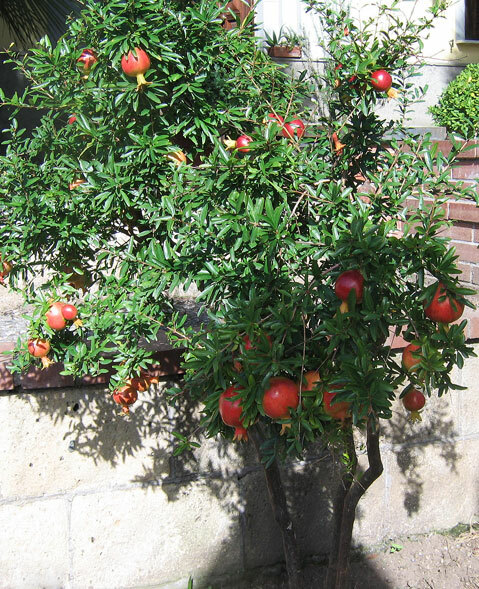 Planting and Growth: Plant your pomegranate tree in full sun in a warm climate in an area that is naturally a little dry. 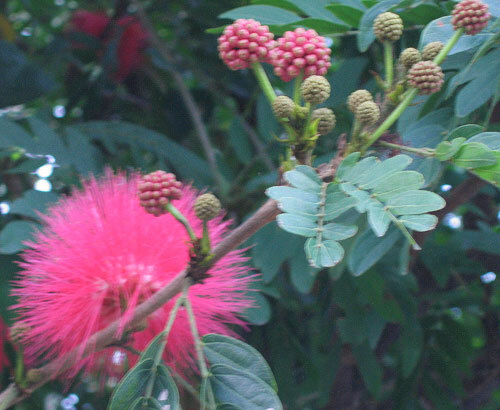 It is a lovely tree and apart from giving us its glorious fruits it has very appealing red flowers. Photographed: On the left at a neighbor's home in Montserrat. On the right in the (Ortobotanico) Botanical Garden in Naples, Italy, in 2014. This beautiful flower seemed to be an escapee or a volunteer in the sunny woodsy area in the Palermo Botanical Garden (Ortobotanico). Its lavender flowers and gray green foliage seemed almost too perfect. Benefits: Poppies of all kinds seem especially delightful to me, and this one is said to have beneficial health effects in traditional medicine. It is also an attractant for birds, butterflies and bees so what could be better? Most importantly these days is the role it plays in the production of illegal opium and heroin and pharmaceutical opioides. Planting and Care: Papaver somniferum is an annual, but its prolific seed production leads it to be considered a perennial. 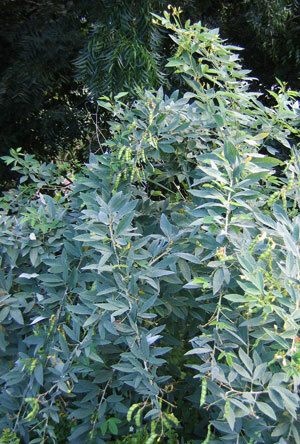 The plant will grow to be about 2 feet tall with its attractive gray/green foliage and 2 to 4 inch blossoms making it a showpiece in any garden. This is one of the smaller continuously blooming poppy varieties and it is one of my favorites. In Montserrat I tried several times to get it past the young, just germinated, phase and it never made it. I read that they will grow in "poor, but well drained soil" which we had plenty of, but I didn't find it to be so. I am tried again at our home at Lake Atitlan in Guatemala where I have also had no luck. 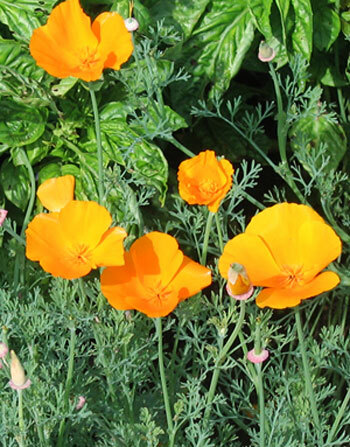 Benefits: California Poppies are edible and an appealing way to enliven salads or decorate dinners and desserts. Photographed: In the Coastal Maine Botanical Gardens, Boothbay Maine, in 2013. Planting and Care: Eschscholzia californica is a pretty hardy perennial plant which I first encountered as a young woman in the garden of my home by the sea in southern New England. 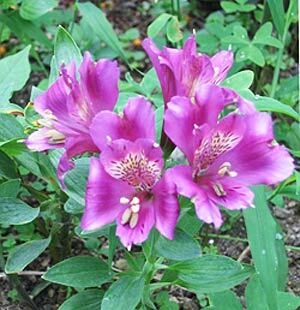 It grew in a wide garden bed with mature peony bushes and irises decorating the whole bed when the larger plants had passed their flowering period. I loved it then and still do. 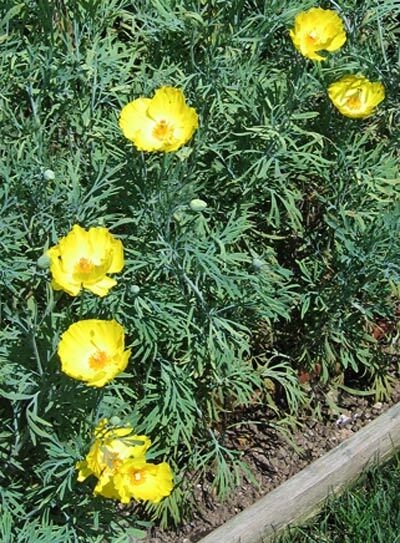 It has buttercup like flowers on feathery gray/green foliage and it proved to be very resilient and easy to care for. Sow your seeds in a garden area with full sun with rich, sandy, well-drained soil. Rainfall should take care of water requirements, but do water the plants when the soil dries out. This plant was a gift of the winds as it simply appeared one day in our deck garden. I left it to grow as I always do with anything I don't know and was very happy when it matured. It is said to be an annual that will flower in the spring and summer and that seemed accurate. 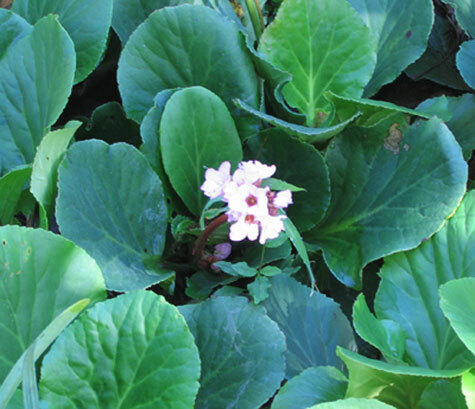 Benefits: As with many traditional herbal remedies, this plant has both healing and toxifying qualities. It was used extensively by the Sonoran Indians of Mexico. Planting and growth: I'd have to say this is one of those survivor plants that are lovely to have in any large garden or for those who do not have a green thumb. It is tolerant of a wide range of soil types and levels of moisture, but it does seem to prefer a sunny spot in the garden. Warning: This plant may be considered toxic. 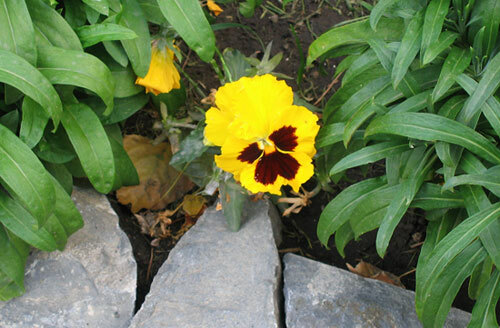 This is a perennial poppy which adjusts well to rocky relatively inhospitable places. 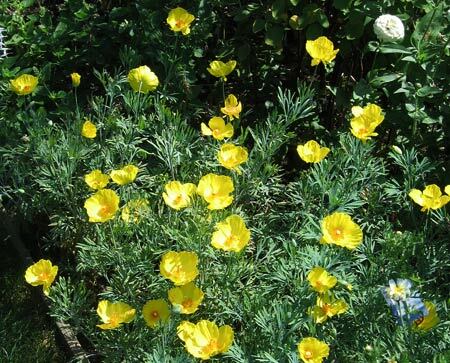 Its flowers are bountiful and very appealing with foliage closely resembling that of the California poppy. Benefits: Nothing I found mentioned benefits aside from just how lovely it is. From: The Mexican highlands at about a mile high in the Chihuahuan Desert from northern Mexico into southern Arizona and Texas. 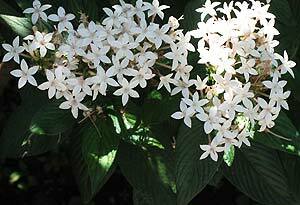 Photographed: In the Thuya Garden, Mt. Desert Island, Maine, 2013. 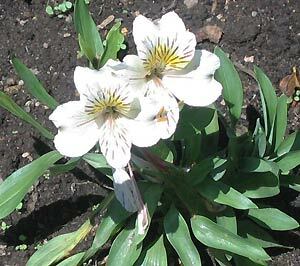 Planting and Care: Plant this little beauty in full sun in one of the drier areas of your garden. It is used to living in difficult circumstances and will happily do so once it is established. With little or no care it will reach a mature height of about 2 feet. 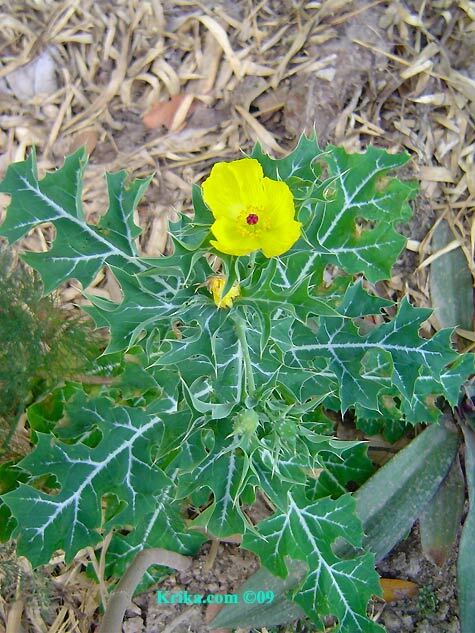 **Yellow Poppy -- See above "Mexican Poppy"
This is a seaside plant pretty much exclusively living by the water. 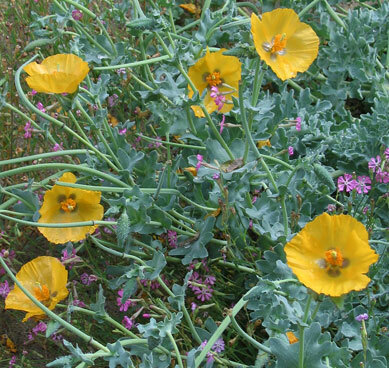 Benefits: As with other poppies this has been used extensively in traditional medicine even though it is very toxic. From: Just about everywhere from Europe and North Africa all the way to western Asia in temperate climate seaside environments. 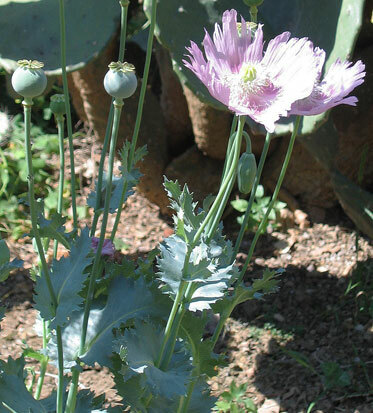 Planting and Care: This poppy has gray/green leaves that are relatively thick and almost leathery. When mature it will reach a height of about 3 feet with flowers that are about 3 inches in diameter so it is one of the showier poppies. Glaucium flavum, once established, grows with little or nothing but a view of the sea. Just about everywhere I looked I found references to what requirements these plants have, but nothing on getting them started as seeds. Apparently it will grow in almost any soil, with any pH, as long as it is in full sun and is never over watered as its view of the sea seems to be enough sustenance. Warning: All parts of this plant are considered poisonous. This is a relatively small tree with deep green heart shaped leaves, interesting yellow flowers and visually appealing fruits, although I can't imagine making a pie with them. 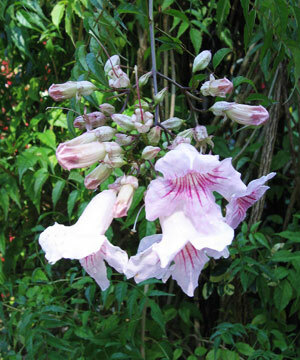 Growing only to about forty feet, it won its place in our Montserrat garden. When we bought our property this tree had been butchered with a machete or what is known in the Caribbean as a cutlass. Its main stem had been cut and its side shoots had become solid four inch thick upward reaching stems. In truth, the first time I saw the tree it looked like a very tall bush. I had committed to leaving in place anything that I couldn't identify until I learned more and this tree was one of the garden's survivors. 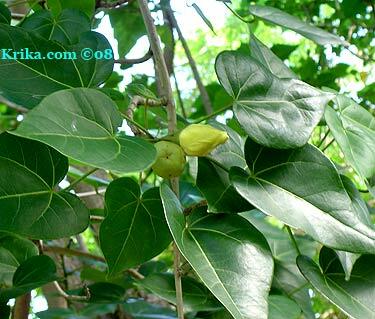 Benefits: If you were to get very hungry, its new leaves, flowers and golf ball sized bright green fruits are all edible. Probably more appealingly, it is prized for the lovely colors of its wood. 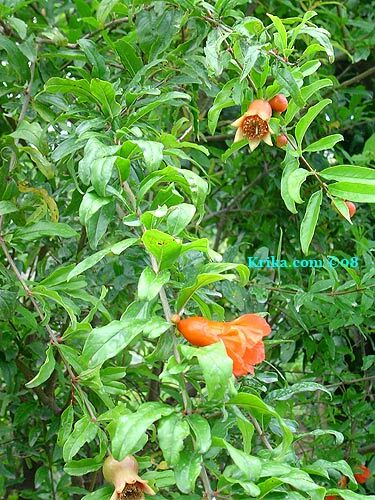 And, if that is not enough, portia's bark, fruit and roots are all said to have medicinal benefits. From: Tropical coastal places around the world. Photographed: On the side end of our property in Montserrat and in the Botanical Garden at the Hotel Atitlan on Lake Atitlan in Guatemala. Planting and Care: Although the portia is said to be native to mangrove swamps and should require lots of water, in Montserrat ours lived just fine on the dry end of our garden in full sun. It prefers a pH of from 5.5 to 6.5. One peculiar feature it has is that it attracts a relative of the cotton stainer bugs that feed on a similar type of tree, the sea hibiscus. The portia's bugs are red and black and seem always to be mating, reminding us of the 'love bugs' in the New Orleans area woods where we camped for a week or two. 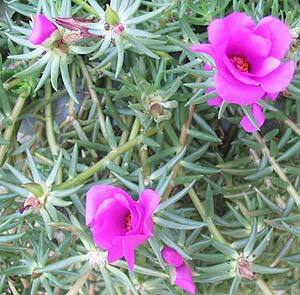 This is a delightful, tough, ground-hugging flowering plant with pine needle like leaves. It can handle full sun and comes with flowers in a range of bright Mexican colors. 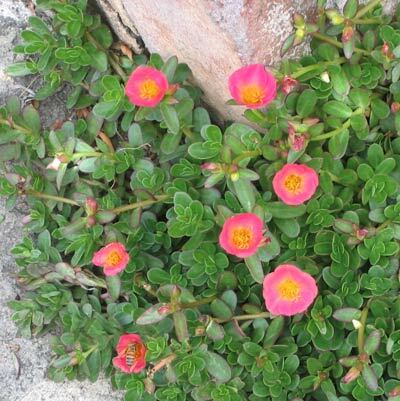 Benefits: Portulaca grandiflora is a plant with a multitude of medicinal applications when taken both internally and externally. Unlike many other medicinal plants it is considered edible -- leaves, roots and seeds. Photographed: Below on the left by the roadside on Mt. Desert Island in Maine in 2013 and on the right by the shore of Lake Atitlan in Guatemala. Planting and Care: Planted in poor soil in bright sun, with regular ground level watering these annual plants will be looking good and in full flower. They are also drought tolerant which is a real plus. This is another delightful, tough, ground-hugging, fleshy, round-leaved, flowering, succulent ground cover. It can handle full sun and comes with flowers in a range of bright Mexican colors. Benefits: All parts of the above ground plant are edible raw in salads or cooked. 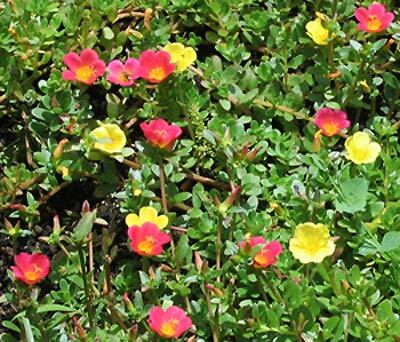 For other plants Portulaca oleracea is a dream companion as it is able to send its roots deep into hard soils that other plants would forsake. 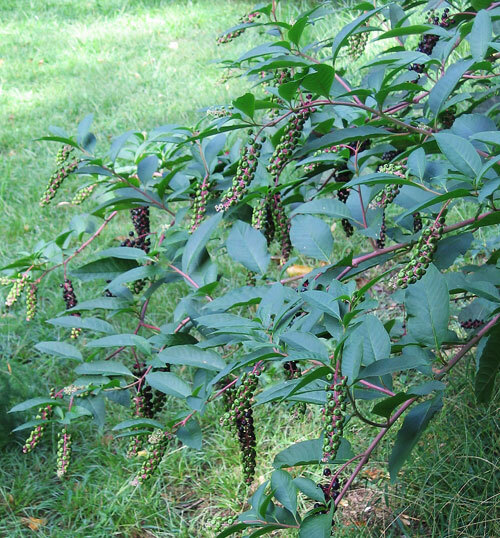 For your health, this is a dream plant for everyone except those with kidney disease. From: This is a plant that almost defies the definition of being 'native to.' It has been recorded in history predating Christianity by 1000's of years. Photographed: On the shore of Lake Atitlan in Guatemala. Planting and Care: Planted in poor soil in bright sun, with regular ground level watering these plants will be looking good and in full flower. 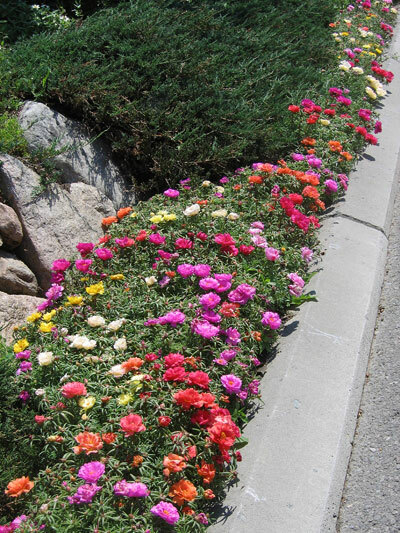 They are also drought tolerant which is a real plus. This is one of those absolutely necessary components in your food and gratefully it's plentiful in fresh foods. It is not something to worry about unless you dine frequently at fast food restaurants. If you do, I wish you well because you have a lot of serious issues. Ahhh....the potato, food of the Gods. Given to the world by the Incan Indians of Peru, the Catholic Irish survived on them until the 19th century potato famine when thousands starved to death while the British exported food from Ireland. I tried growing chunks of a sprouting potato when living on the Caribbean island of Montserrat and had great luck with the plants coming up. However, they didn't last long as something killed them; I know not what. I tried again as I have had good luck even growing the plants in large buckets on our terrace in Taxco, Mexico, but I had no luck once again. I found out later that the Montserrat Department of Agriculture had permitted diseased seed potatoes to enter the country. Within a short period of time, this precluded growing potatoes on the island. Benefits: Potatoes are loaded with potassium and for some people a potato makes a good muscle cramping cure. For me, they work in an opposite way. If I eat a lot of potatoes, which I'm inclined to do, I wake in the night with cramping legs. Always avoid potatoes which have ben exposed to sunlight or other strong light. They turn green and consuming them is not healthy. Photographed: I don't yet have one, but they are pretty plants. Planting and Care: Find a type of potato that you like and keep it in a dark, dry, cool place until it begins to sprout. Once it has sprouted, cut the potato in pieces that each have a green sprout. Let them air dry in a cool place for a few days then head out to the garden. Plant your sprouting potato pieces an inch or two deep in rich well-draining organic soil separating them by about 15 inches in a wide raised garden row. Water them lightly if the soil dries out and wait. Deep green leaves will appear and grow into a a plant about a foot and a half tall. Once it has flowered, dig carefully at the outer edges of each plant to find the potatoes you'll want to eat that day. At the end of your growing season carefully dig deeply around each plant to collect your potatoes both large and small. Leave them to dry on top of the soil for a day then gather them up for your cool, dark and dry root cellar. WARNING: Potatoes in Mexico, the US and now some varieties in the EU are GMO tainted. I don't recommend eating them. Please, for your good health, buy only organic potatoes. This is the popular hanging plant with green and white leaves that so many of us have had in our shady windows up north. 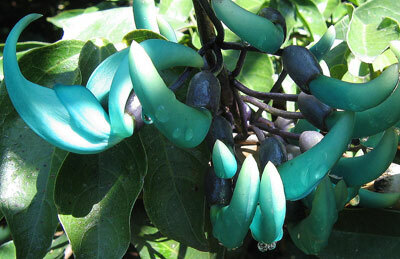 It is similar to a philodendron, but more attractive and just as easy to care for. In Montserrat pothos appears just as it does in New England until it finds something to grow on. Then it becomes an entirely different animal. The leaves grow to more than 12 inches wide and the vine that supports the leaves will be an inch or more thick. Benefits: This is plant that will help to clean your indoor environment of of chemicals such as formaldehyde, trichloroethene, toluene, xylene, and benzene. Photographed: At the back our our property in Montserrat. 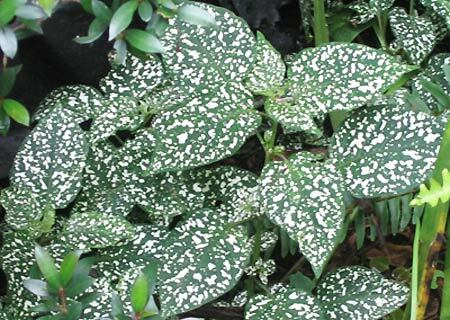 Planting and Care: Epipremnum aureum is extremely hardy and, though it prefers morning sun, it will grow in low light as well. When mature in a tropical setting it will reach a length of 1300 feet. In your home it will thrive with little or no care if planted in a good quality potting soil, watered when dry and hung in a pot in a bright light window. Warning: Despite its benefits in cleaning your indoor environment of toxic chemicals, pothos itself is considered toxic to both animals and humans. This is a very common easy to care for cold climate indoor plant. 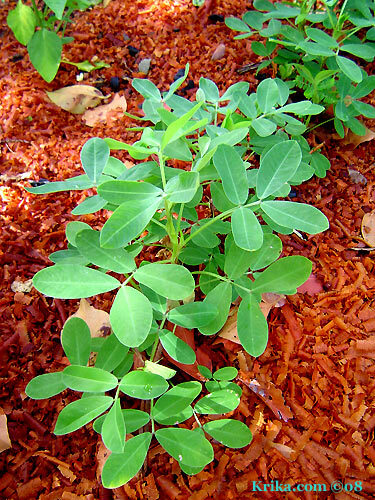 In warm climates it is a wonderful, easy to grow, shady garden, ground cover. Photographed: To the left at the Winter Garden in Auckland, New Zealand, in 2013 and below at the Royal Botanic Garden in Sydney, Australia, in 2013. 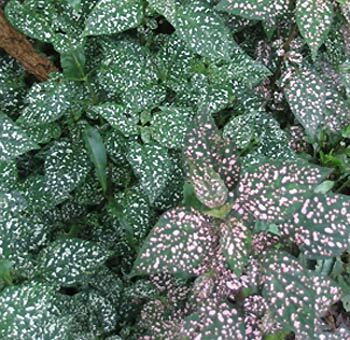 Planting and Care: Prayer plants prefer to have just a little of everything -- decent soil, some bright light and a bit of water. It does also prefer a humid environment. 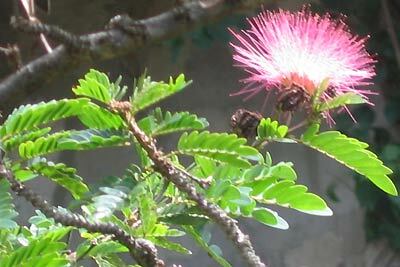 This spiny, bush-like tree flowers almost the year round with bright yellow or combinations of pink and white or red and yellow petals. The stems have very sharp spines. 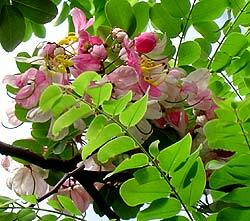 Benefits: The leaves and flowers of Caesalpinia pulcherrima have long been used in traditional medicines. Planting and Care: Our property received a fair share of rain for a place in the Caribbean. Unfortunately, the average tropical soil does not absorb or hold moisture well so I'd have to give a round of applause to this plant that will even grow in Barbados, an island much to our south and very dry in comparison to ours. My advice is to plant them anywhere there is full sun to semi shade and then sit back and enjoy. Pruning is a good idea and the plants do seem to do especially well when it is done. Warning: Mature seeds of this plant are poisonous. Benefits: Aside from being a stunning flowering plant, it attracts hummingbirds, bees and butterflies. From: The Portuguese island of Madeira. Photographed: In the Ortobotanico (Botanical Garden) in Naples, Italy, in 2014. 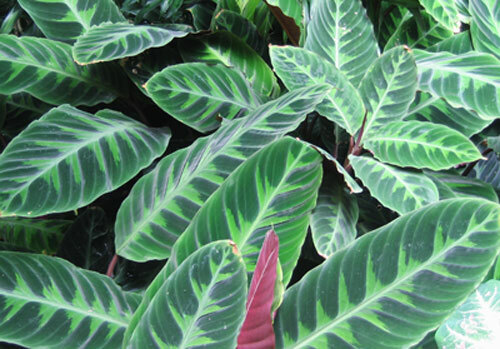 Planting and Care: This plant is not tropical, but will need protection if winters in your garden area will be below 40° for an extended period of time. 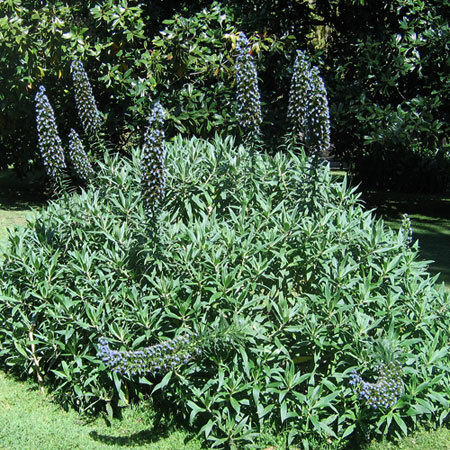 Once settled in, Echium fastuosum is resistant to drought and will live happily in a coastal area. When mature it will be about 5 feet in height and will reach about 6 feet in width. It will bloom for an extended period from May through August making it almost ideal in any garden. Plant it in full sun and keep it on the dry side. 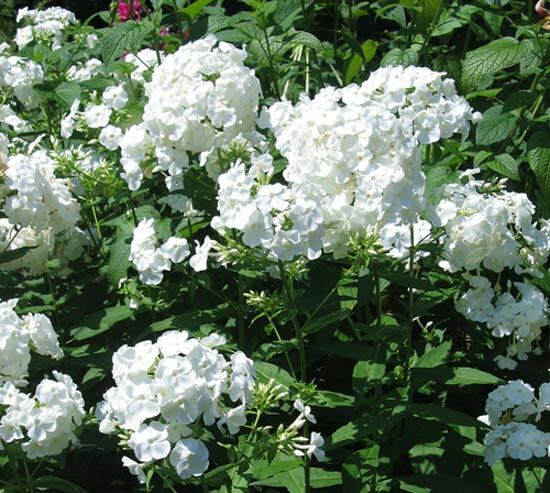 This is a biennial plant that is tolerant of most soil types. 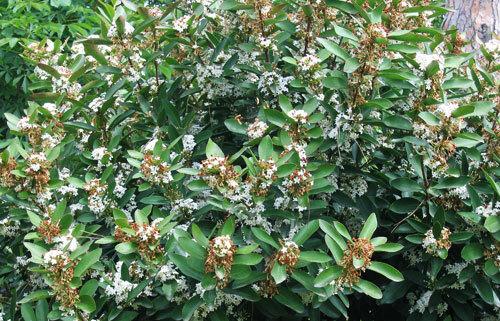 In its first year it will produce foliage and in the second foliage with spikes of beautiful flowers. In most places it will self seed. 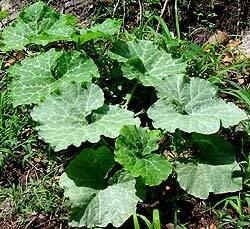 Pumpkin in the Caribbean is eaten as what we in New England call winter squash. 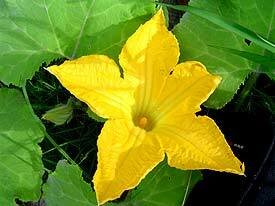 It is a vine like squash plant, but it is virulent and tough. Instead of the gardener having to pile up dirt around a growth point, this plant will send down roots of its own along its growth path. It will grow in every direction and here and there it will grow a pumpkin which will become at least 20" in length and probably more in girth. 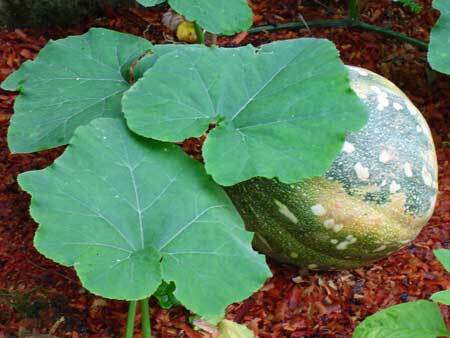 Eaten in their natural state, pumpkin seeds are said to rid your intestines of parasites. The seeds are also great sources of zinc, vitamin E and sulfur. The high levels of zinc in pumpkin seeds may help in slowing hair loss. Photographed: In our banana garden at our former home in Montserrat. Planting and Care: Start plants in small containers and then set out in the garden spacing them about one yard apart. Work over the soil well adding lots of composted manure. When the flowers begin to bloom, take a look to see which are male and which are female. The latter have a tiny fruit just below the bloom. Take one of the male flowers and pollinate the female by doing what seems natural. This will greatly increase your yield if you have the same problem we had on Montserrat -- no pollinators. Our plants grew beautifully each producing huge pumpkins, which were then spotted by the wild agoutis which you can see on the "W" Page. They are charming little fellows that are easy to fool. As our pumpkins were maturing we piled leaves on top hiding them from the agoutis and it worked perfectly. Carefully wash the exterior of the squash. Cut it in half and clean out the seeds and membranes. Put the halves cut side up in a large baking pan in the oven at 350° F. When you can stick a fork in any part of the halves, they're done. Remove them from the oven and scoop the squash out of the skins with a good strong spoon. Mash the squash and cook it with lots of butter and brown sugar for a great treat. This perennial plant growing up to six feet in height could easily serve as a focal point in a garden bed. I found it striking and you may too. It blooms in the latter part of summer. Benefits: This plant is known to have been used in traditional Chinese medicine. Photographed: Coastal Maine Botanical Gardens, Boothbay Maine, 2013. Planting and Care: This plant will do well in full sun or semi shade as long as it has moist soil. 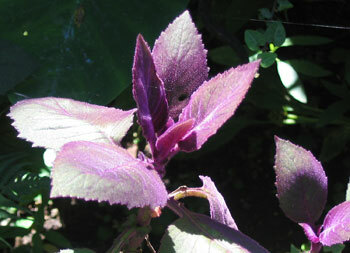 This is an unremarkable small bush with mottled grayish green and subdued purple leaves. We had it growing in the shade in what we call one of our plant parking lots, a shady place to put plants that we aren't yet ready to plant permanently elsewhere in the garden. This plant was proudly given to us by a garden assistant a few years ago and might have earned a better place had I known that the bush flowers, though it did not do so in the shade. Benefits: This is a butterfly attractant. Photographed: In our shady terrace garden at our former home in Montserrat. Planting and Care: Said to grow well in full sun to semi shade, I would have to say full sun did not seem a happy placement for this plant even after it had time to adjust to its move from a shady place. I think perhaps bright light would be best. It is happy with just a moderate amount of water and has in fact survived droughts when we were away for months at a time. I found this furry purple plant in Panajachel growing outside and recalled having one as a houseplant when I was in college in Boston. I loved it then and still do. Benefits: I haven't found any medicinal benefits as of now. Planting and Care: As a houseplant in New England Gynura aurantiaca does very well hung in a sunny window and watered when dry. It is not at all fussy. Outside in a warm climate, I would plant it in a morning sun spot in the garden and make sure that it receives rainfall or watering on a regular basis. Try to be careful about getting the leaves wet when watering as they can become unattractively spotted. 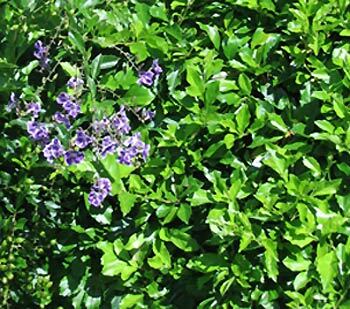 Duranta erecta is a tall and wide growing somewhat undisciplined shrub that may reach a height of 20 feet with a spread also of about that size. Mature plants develop thorns that are absent on younger plants. Benefits: Butterflies and hummingbirds like these somewhat scruffy shrubs as much as we do. Planting and Care: This is one of those flexible plants able to live well in full sun or partial shade and equally able to put its roots into sweet, acidic or neutral soils. Do remember that it is tropical in origin so it will not survive a freezing winter. Nor will I for that matter.